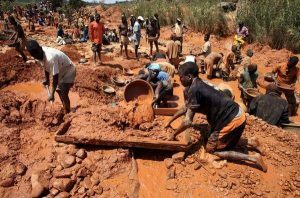 Government has been asked to nationalize the country’s mining sector to help halt the incessant illegal mining by some Ghanaians and their foreign counterparts. The Economic Fighters League, a pro-CPP pressure group, made the call in a statement signed by one of its senior members, Commander Hardi Yakubu. The pressure group said it had taken note of the recent outcry over illegal mining, otherwise known as ‘galamsey,’ which negatively impacts the environment. The group accused some of the big mining companies in the country, including Newmont, AngloGold Ashanti, IAMGOLD Corp, Gold Fields, of equally causing great harm to the environment in Ghana. “Undoubtedly, citizens’ concerns about this phenomenon are well-founded. However, merely expressing their angst on social media is not enough. The government’s response to the recent hue and cry has been as usual abysmal and disappointing,” it said. “We call for the full nationalization of the mining industry in Ghana. AngloGold, Newmont, IAMGOLD Corp, Gold Fields, Adamus Resources Ltd., African Gold plc, Moydow Mines International Inc., Pelangio Mines Inc., Perseus Mining Limited and Xtra Gold Resources Limited have to be sacked for good. They are causing the same harm as the Chinese and illegal miners. “We call for the immediate amendment of Article 257 Clause 6 of the 1992 constitution that vests all our mineral resources in the President on behalf of, and in trust for the people of Ghana to an expanded body of trusted persons drawn from the broader masses of the people,” the statement added.